the Doctors body in a river. So he was decomposing for almost 2 months, but they very rapidly determined that his death was due to drowning (I mean what did they find water in his lungs and came to that conclusion, after 2 months in a river). They also, and all news agencies, were VERY quick to point out that there were no signs of foul play, even though everything important to him were left in his house. Wallet, keys, cell phone, and one more thing. He lived with his beloved dog Bojangles. He wasn't married, so his dog was his closest companion, and they say he loved the dog, of course, that is what dogs do, they steal our hearts. No dog lover would lock their dog in the house and go to commit suicide. No way, not a chance. This lays our the story of this Doctor, after promoting flu shots for the young children, now stating that the Flu vaccine actually is causing this years flu epidemic, AND causing deaths. – Authorities are trying to make it appear that the disappearance of this young intelligent Black man, who is a ranking official at the CDC, is somehow due to suicide. 1. Dr. Timothy Cunningham is an acclaimed scientist who was actively RESEARCHING and EXPOSING the origin of major killers of Blacks in the US and Africa. He saw and spoke out about the Big, the Bad and the Ugly, of 2 major government manipulators: Big Pharma and the NRA. 2. People who knew him closely have affirmed that suicide would be completely out of character, for him, even after being passed over for a promotion. 3. Whoever framed the cover-up of suicide for a young Black male doctor, should’ve first done their research. Statistics show that suicide is not rare in high achieving White men but comparatively unlikely in a successful, and well educated Black man. Historically, Black men being passed over for promotions is commonplace in this country. Imagine if we were prone to suicide after being passed over for promotions? Would we have professionals in any field at all?? What’s more, it’s likely that Dr. Cunningham experienced numerous such disappointments during his academic and professional career. Suicide?? Preposterous! I need to see the evidence and currently there is NONE readily seen! Wouldn’t you have expected this meticulous, caring thinker to have left a note of some kind to his family with whom he was so close? No, my critique of this situation is that he does not fit the profile of a person who was suicidal based on what has been revealed thru relatively thorough media coverage. Nor can the baffled authorities identify ANY credible or valid indication of a suicide. 4. Big Bad Pharma is under serious attack as they’re being increasingly exposed for corruption despite involvement with their #1 ally for protection and support – GOVERNMENT (FDA, CDC, NIH, Law Makers, etc). Is their any connection here with Dr. Cunningham??? I don’t know, but we do know that Dr. Cunningham WAS in the know and that knowing could have put him in jeapordy. What we also know is that Big Bad Pharma is fighting to stay alive and they fight dirty as does the NRA! 5. WHY has there been a complete ignoring of the fact that he was ill enough to call in sick multiple days and went home saying he felt ill???? Was he being poisoned? Was this common for him? If he was ill, why would he disappear leaving everything behind?? This man was fighting for us where it counts and every person of color should be looking to ensure that he was not victimized for putting himself in harms way for us. I pray that God brings swift revelation and resolution to this very troubling situation. All alphabet soup agencies are now suspect. 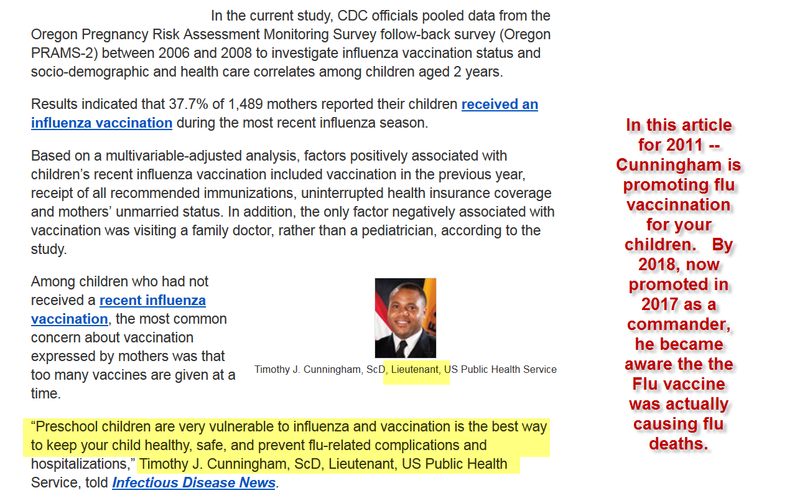 Meet Rod Rosenstein's sister, Dr. Nancy Messonnier, head of Immunization and Respiratory Diseases at the C.D.C. in Atlanta.